Maven is a Java application, so we are just fine with expanding product zip package and setting environment variables M2_HOME and JAVA_HOME and set PATH. (possibly) Organize modules such as device ID management. 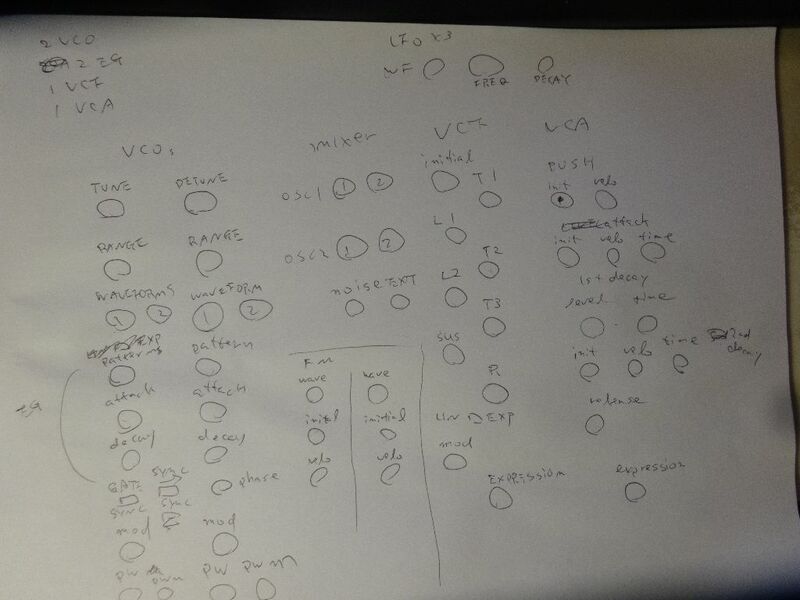 Designing and implementing MOM and synth module data model is yet another challenge out of building CAN network. Basically, the inter-module communication depends on CAN physical layer, but it’s a pain to dragging such a dependency during the MOM development. I’m sure the CAN network would be quite unstable at first and I don’t want to stop and troubleshoot CAN while I’m working on MOM. So, in order to remove dependency on CAN network, I’ll build the initial version of MOM based on TCP/IP with dummy (stub) synth modules that are purely software oriented and talk TCP/IP. Once the MOM design is fixed, I can replace the TCP/IP driver by CAN driver later. It will not ruin the module data model. 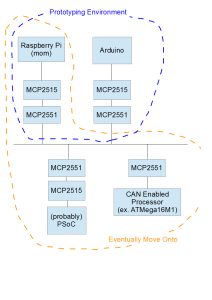 As I mentioned in the previous article, I’ll use MCP2515 CAN controller for inter-module communication (initially, at least) for the Analog3 Project. Datasheet of this device is available at the product page. 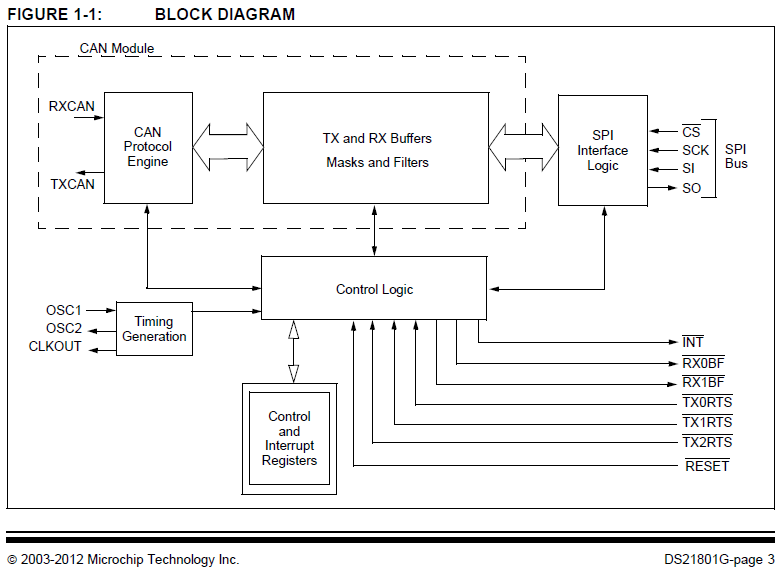 MCP2515 consists of CAN protocol engine, data buffers, controller, and SPI interface as illustrated in the picture below. You need to attach a processor to make this device functional. In early phase of the project, I’m thinking of using a Raspberry Pi as the Master Of Modules (mom) and Arduino’s for dummy synthesizer modules. Arduino is not a realistic solution for Analog3 both in terms of cost and performance. 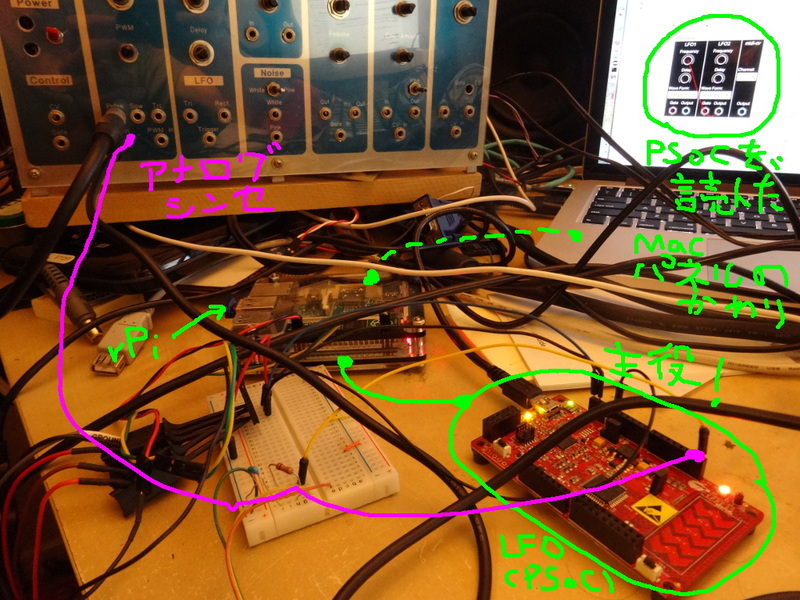 So, I’m thinking of implementing a common synthesizer module driver based on PSoC or CAN enabled AVR. MCP2551 is CAN transceiver. I’ve been trying for a year to make my own serial interface protocol to exchange data among synth modules. Though it showed some progress, I kind of giving up this approach. The problem is complexity of serial interface controller. A controller for multi-master serial interface is complex. Implementing using a generic device is more costly in many sense than I expected. I started with Arduino. This was the easiest approach but channel was too slow. I could only achieve 50kbps. Then I tried implementing it into AVR using assembler language. It went 100kbps but it was about the limit. The most serious problem with MPU was that the processing is always on single thread. Some data processing has to be done in parallel during data reception, but it was pretty inefficient to run such concurrent tasks on 8-bit simple processor. Overhead for such multi-tasking killed the speed. Then, I moved onto PSoC. It achieves bit rate 400kbps easily and it might go higher if it’s tuned well. However, the logic to handle collision is so complex that I eventually am suffered from lack of resources in PSoC. So at this point, it seems more practical to use a ready-made implementation of an existing protocol, which is CAN. 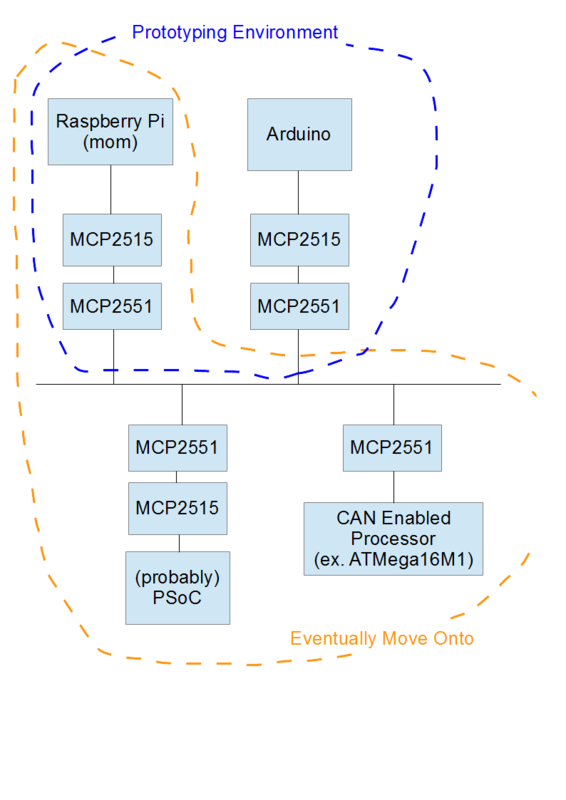 Use cheap CAN controller and transceiver: MCP2515 and MCP2551. 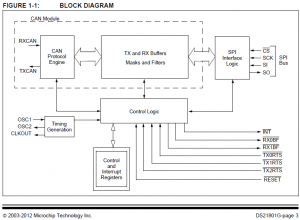 MCP2515 is controlled by SPI. Most processors can use it. I’ll use Raspberry Pi for the master synth controller module. Synth modules can be based on PSoC or AVR. These two are ones I am familiar with. I’ll give up some features such as oscillator sync network. Search engine helps, but I’m so lazy that I don’t like to do the same search repeatedly. Use application “Wifi Configuration” from GUI menu. The I2C slave that I’m developing has been failing intermittently. I finally noticed this was a known bug in Raspberry Pi that mishandles clock stretching. I2C slave may delay response by holding SCL low. However, when the slave does it, the I2C master in Raspberry Pi gives very short clock for the first bit of the next byte. The symptom can be seen as following picture. In order to workaround this, I set data rate in I2C slave module higher. The communication rate is 400 kbps, but I set the data rate 1000 kbps. It worked for me. Here is the setup of I2C slave module.